why do i get the urge to push them all off? EDIT: bloody hell, that's some swift FP'ing! Amazing how the legs fit so closely. it to the larger post. and I don't mean in a retarded, mong kind of way. and I think that's more meaningful. 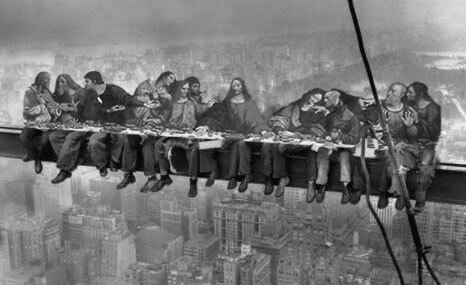 "Among the most famous and iconic photographs of all time, Lunchtime atop a Skyscraper (New York Construction Workers Lunching on a Crossbeam) was taken in 1932 by Charles C. Ebbets during the construction of Rockefeller Center in New York City." And now with frontpagey goodness! This stopped me in my tracks, while trying to get some quick b3ta in. That's one for this side of the hemisphere. - if somehow I managed to be the first ever to combine them I will will be shocked! thanks again to all for the very nice comments! 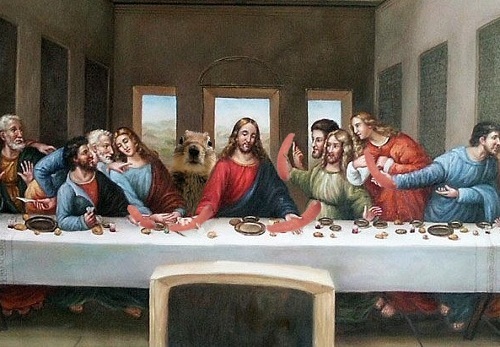 The only niggle I have is the last supper appears as a mirror image. Other than that superb!